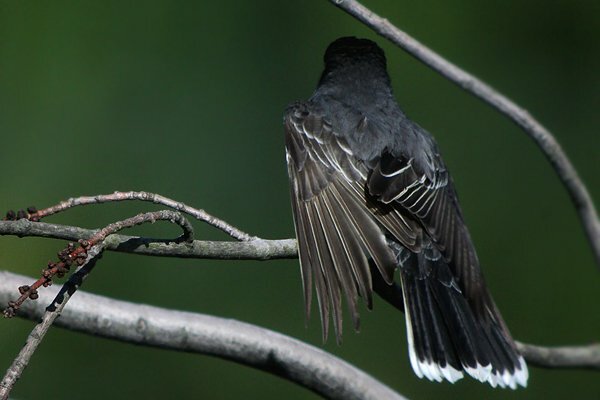 Eastern Kingbirds are dark above, white below, and boast a distinctive white-tipped tail. Their red crown patch is usually hidden and rarely seen except by extremely lucky birders. 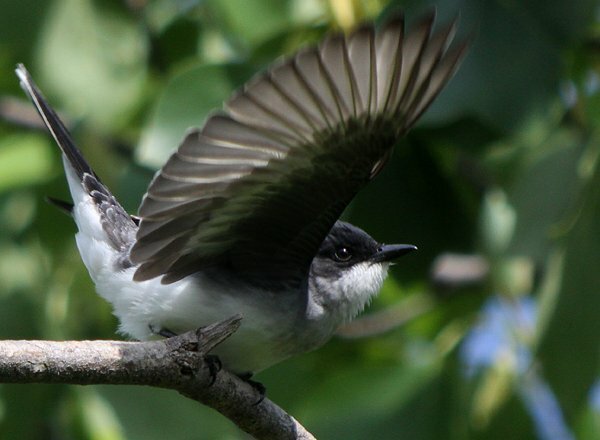 Kingbirds are quick to snag any bug that comes their way and make short work of them with their slightly hooked bill. They both perch hunt and hover hunt and will even hop along the ground in pursuit of prey. 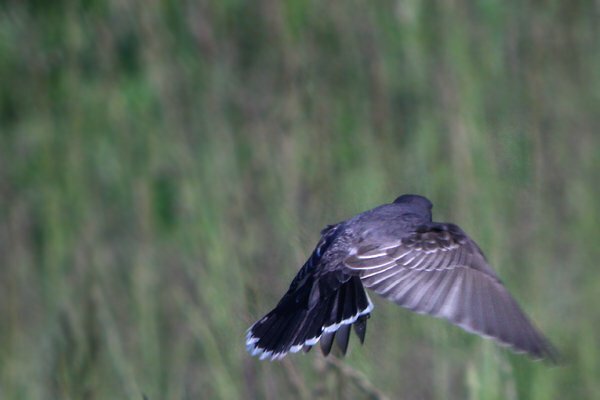 Eastern Kingbirds can pull off amazing aerial maneuvers but can also look very inefficient in flight. 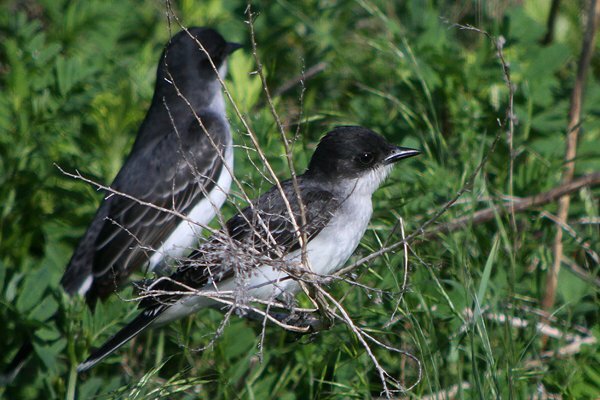 Whatever they are doing – hunting, chasing other birds, or just flying around – Eastern Kingbirds are fun to watch. They are fiercely territorial on breeding territory, but in migration they often gather in rather large numbers. The activity of a flock of kingbirds working a patch of grassland is something to behold. Their frenetic activity forces you to constantly change which bird you are watching and something is always happening. One bird will be flycatching, one preening, one trying to find the perfect perch, one taking a big bug apart, one down in the grass chasing after prey and having only two eyes you are at a distinct disadvantage. 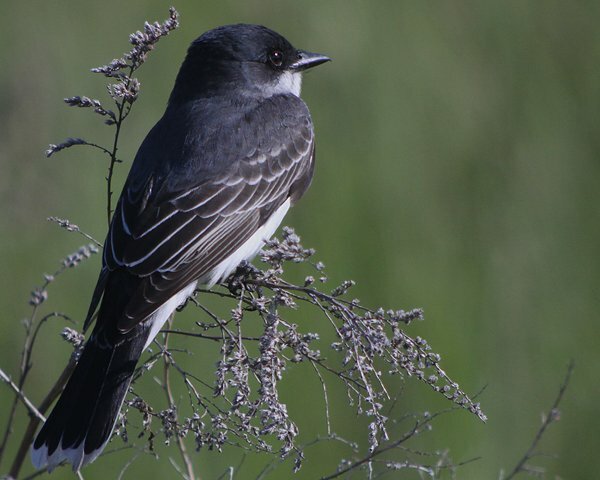 Eastern Kingbirds breed across the eastern United States and much of southern Canada. They migrate through Central America and winter in South America, apparently almost entirely east of the Andes. BirdLife International lists them as a Species of Least Concern because of their enormous range and population of approximately 13,000,000 individuals, though the population does seem to be decreasing slightly. …Into the defense of its holdings the Kingbird throws itself with a combativeness that is unmistakably exhilarating to it. This is no mere functional protection of the nesting area from injurious invasion. That is evident from the zealous territorialist’s enthusiastic pursuit of birds offering not the least threat, preferably big birds. When hawks are lacking a wholly innocuous heron will do. What counts is the sport of the thing, the demonstration of prowess. It is the heady wine of victory. You can tell that from the jaunty bearing of the small warrior when it returns from a high-climbing pursuit in a series of glissandos to fetch up on its tree-top perch. “Tsee-ee-ee-ee-ee-ee-ee!” it cries, tail spread, wings trembling and flaming crown doubtless displayed. I’ve been very lucky this spring at finding some relatively cooperative Eastern Kingbirds to digiscope. Enjoy! 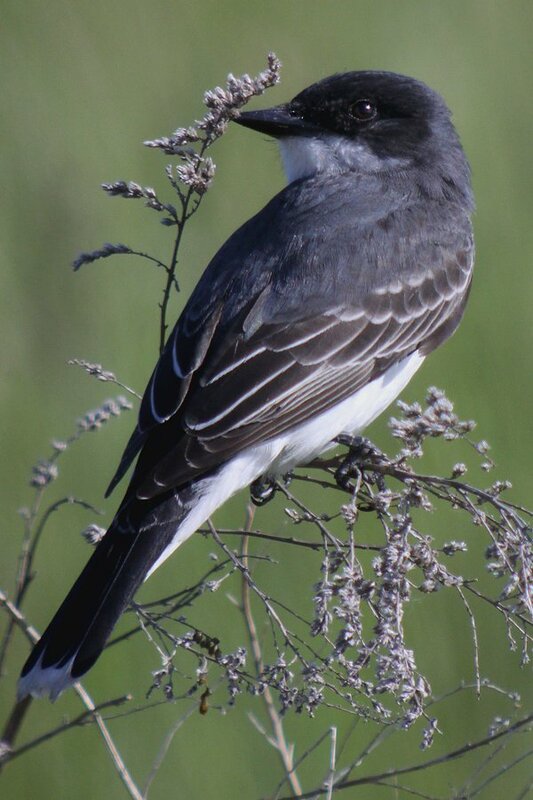 I hope you liked these shots of Eastern Kingbirds. If you want to see more great images of birds check out our big and growing page of photo galleries, 10,000 Clicks! I think to translate it as “tyrant of tyrants” it would have to be Tyrannus tyrannorum. As it is, it’s more like Tyrant the tyrant. 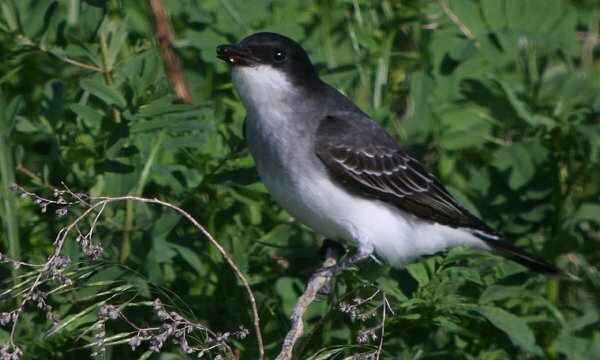 Love those Eastern Kingbird pics. I see them doing their flock thing as they migrate through Costa Rica but that can’t change my first, lasting impressions of this handsome feisty species- chattering birds of Summer hay fields on sunny, June days in upstate New York. 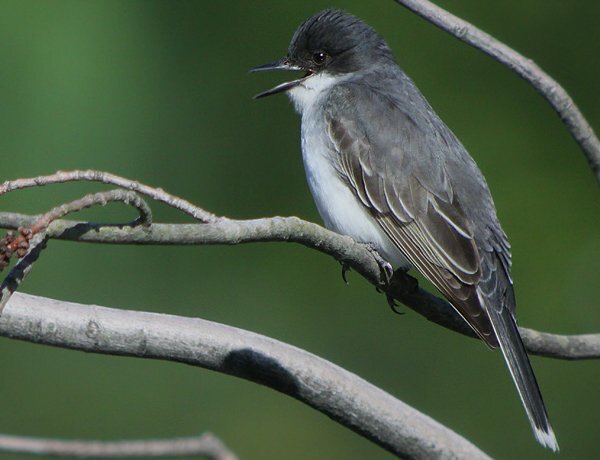 For several years, a pair of kingbirds nested on one side of a large tree in Prospect Park and a pair of Baltimore orioles on the other side. I never saw any antagonistic action toward each other, and for about three years they each nested in their respective side of the tree. I think they successfully fledged young most years. Maybe the oriole chose to nest near the kingbird for protection? Although Baltimore orioles are pretty good at defense, too–they just don’t go out looking for a fight. 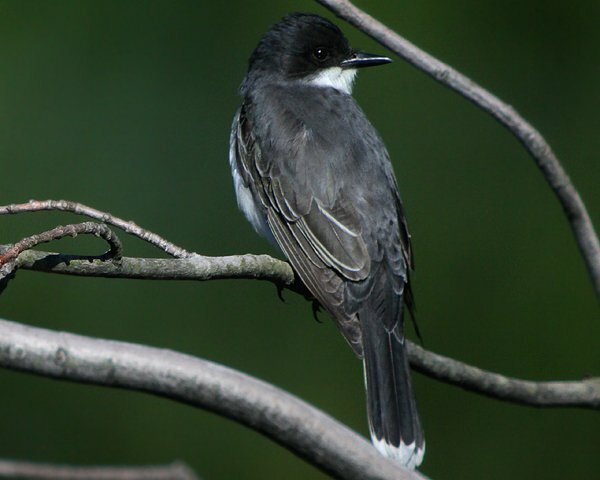 I, too, love our Eastern kingbirds. Someone did point out a flock in flight that I couldn’t ID; apparently they have a funny flight pattern? Several years ago I observed an Eastern Kingbird, perched on a snag over a small pond, give chase to a flyby Great Blue Heron. Can you guess which bird was the lion and which one the mouse? Why Go To the Midwest Birding Symposium?